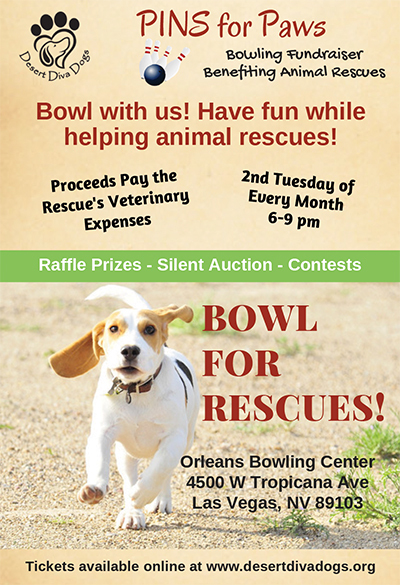 Join Desert Diva Dogs for our monthly Pins for Paws bowling fundraiser! Enjoy an evening of bowling and fun at the Orleans Bowling Center. This is a great event for families, company team building, meeting up with friends, or meeting new people who also love animals! Event highlights include a fun evening of bowling and socializing with other animal lovers, goody bags, great silent auction and raffle prizes, bowling contest prizes, and more! We accept cash and credit at the event. All event proceeds benefit our Rescue of the Month by going directly toward their veterinary expenses. Your ticket purchase includes 3-hours of bowling (from 6-9 pm), shoe rental, a slice of pizza, soft drink, and one raffle ticket. Non-bowler tickets are also available, which include a slice of pizza, soft drink, and one raffle ticket. Additional raffle tickets are available for purchase at the event. *Additional food/drink items can be purchased at the Snack Bar or Lounge at the Orleans Bowling Center, or one of the many wonderful restaurants at The Orleans Hotel & Casino prior to or after the event. Check-in starts at 5:30 pm; Bowling begins at 6:00 pm. Prepaid spots will be held until 6:15 pm. First come, first served until all available spots are filled. Bowling events can be very stressful to animals due to the high volume of patrons, activity level, and noise. Therefore, we must enforce that pets are left at home for their own safety and well-being.